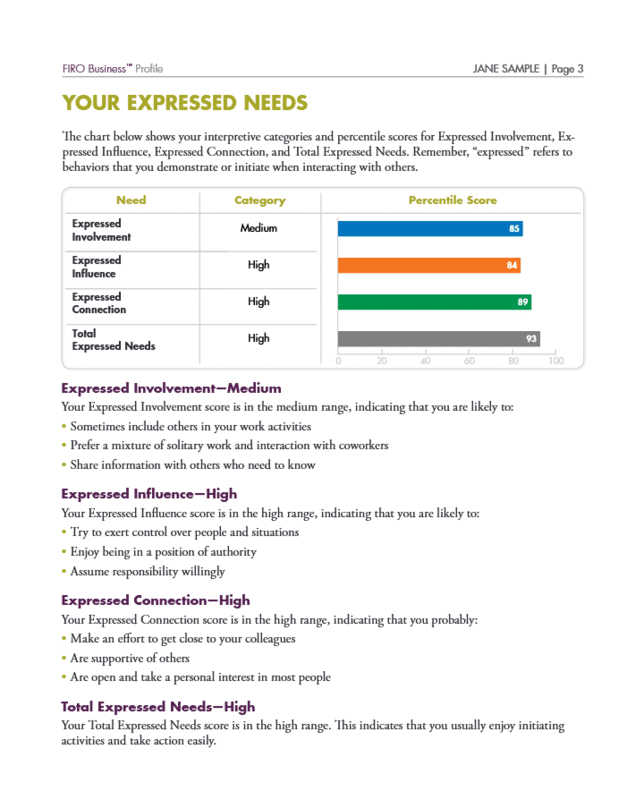 For more than 50 years, the Fundamental Interpersonal Relations Orientation™ (FIRO®) approach has helped people understand their interpersonal needs and how those needs influence their communication styles and behavior. Building on the history and reliability of the FIRO model, the FIRO Business® assessment addresses the specific requirements of organizations. The FIRO Business assessment helps you develop great leaders while improving organizational performance. It is particularly valuable to businesses because it quickly gathers key insights for relating to direct reports, superiors, and peers, influencing and negotiating, making decisions, and setting priorities. 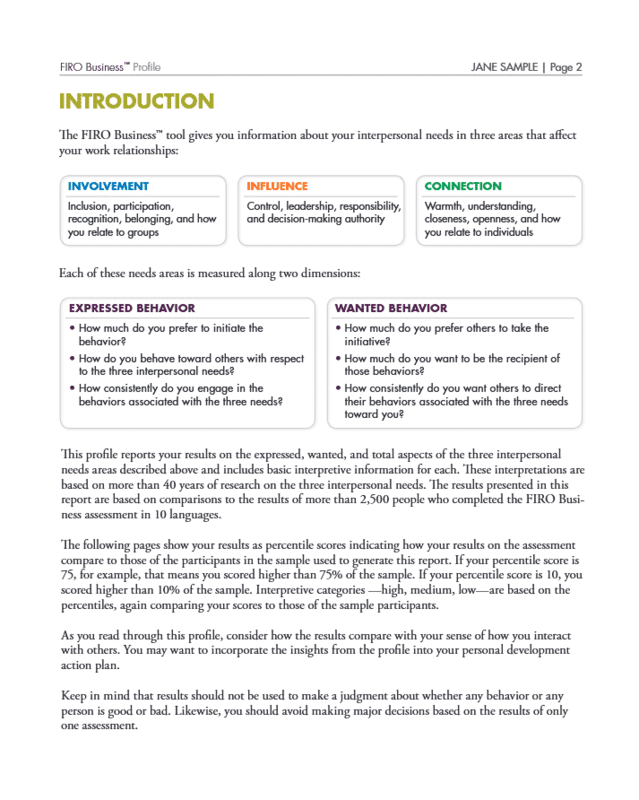 The FIRO Business® Profile measures Expressed and Wanted interpersonal needs in three areas that affect work relationships: Involvement, Influence and Connection. The FIRO Business Profile provides a basic summary of the FIRO Business assessment results and is useful in business applications such as communication workshops and team building. The FIRO Business® Leadership Report is particularly valuable to businesses because it presents key insights for relating to direct reports, superiors, and peers, influencing and negotiating, making decisions, and setting priorities. 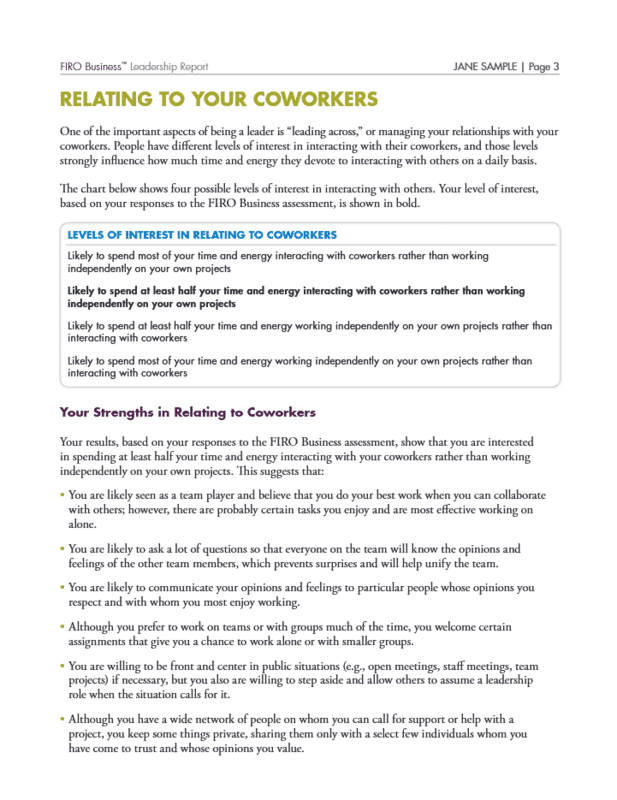 The report is a must-use tool for leadership development and executive coaching. 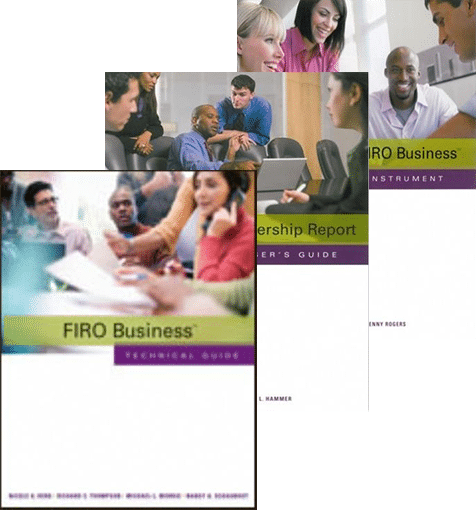 The FIRO Business® Leadership Report is particularly valuable to businesses because it presents key insights for relating to direct reports, superiors, and peers, influencing and negotiating, making decisions, and setting priorities. The FIRO Business Profile provides a basic summary of the FIRO Business assessment results and is useful in business applications such as communication workshops and team building.